Feeding the chickens greens out in their coop - they really love clover, 'headknocker' which Grandma says is the name for a certain sort of garden weed we have in abundance, and honeysuckle flowers. Our potato plants, seeded from some kitchen potatoes we had left too long in March - are doing very well. I think the flowers are very pretty. I had remembered Potato flowers being yellow, for some reason - bright yellow-green yellow, from my childhood. I wonder if I was just mistaken or if this is just a different kind? I really think I was just mistaken...as all the pictures I can find are purple or white, and that seems to ring some, too. Washing and counting the eggs after she brings them in. We had five, today. She said one for each hen, but not one for each rooster. There were four lying in the box and one in the coop, and she was able to tell the hen to give her that one in the coop and not have it break. We received a large box of fabric from a lady at work the other day - it was being passed down in her church to find someone to use it. I am planning making some things for Esme out of it but haven't gotten started on anything more than washing a few pieces and going through patterns. She has grown quite a bit since the last time I did this! She is now in between the size 6 and size 7 patterns - which is just where she 'should' be... I should make a few for summer and then start on a few for next year. There is a gorgeous royal blue with darker blue flowers fabric that is in many pieces - but I can almost see a long sleeved dress still coming together out of it. The lady at work said she saw the 'patchwork' possibilities in the box - and that is the main reason she thought of my sewing style and Esme's dresses. :) There was also a big bag of a pretty green metallic yarn, which I am kind of thinking of as a random birthday present. I was thinking about green yarn :) Even though my birthday isn't until next month, I am looking forward to that day to have off, sit in the sun, and think. So much has happened this year. I took a long nap today - had a bad stomach event last night after feeling bad since Friday morning... trying to find a way back to feeling okay but in the meantime it means I haven't gotten much done. We did give away several kittens... that was yesterday. Esme is a bit bummed that I haven't played more with her.. but she is bopping around the house entertaining herself mostly. I have a pot of lavendar started in the house that I want to plant near this, and there is a volunteer Cherokee Rose starting there, too. Our perennial garden is going well. We went fishing for a bit. It was humans 5, fish 1. One of them took off with my hook after it got dropped/knocked out of my hand and got the string caught up under the dock where I couldn't get to it anymore. Another experiment in basket making with the cheap sisal twine. This is a little 'canteen' type purse with a cover and a button to hold it shut. I used green crochet thread for both some shape stability and to cover up the rough handle so it could be carried without sticking bits of sisal into my shoulder.. It also gave it a nice 'spiderweb' or turtle shell look. My favorite thing about it is that it sits nicely just behind my shoulder. And although it is a little too small to hold a knitting project very well - the bamboo needles will stick through the holes and hold a washcloth, scissors and a ball of cotton yarn. It would be a great daypack to carry a few little things along to the park or the lake. We are pretty sure she will be a first grader next year. Grades get delivered tomorrow. And then we have a whole summer stretched out before us. I harvested radishes and kale from the garden, and threw the last of the brussel sprouts from the freezer into this. It was enough for just me - but that was ok.. not really Mark's thing, especially with mustard :) He did make me a hamburger patty with lots of onion powder and black pepper mixed in with it to go along side this - and it was a great match. Steam in sauce until sauce just begins to thicken and kale is thoroughly wilted, brussel sprouts are not frozen etc. Then I put the onion and pepper patty on a good deli hamburger bun, sliced it in to eighths and used them as a mop up for the rest of the mustard sauce, which really picked up on the other spice flavors. In Other News : Esme's last week of school is coming up. It will be a lot to do... then a whole summer to plan fun things here and there. The pepper plant started flowering - the peas are about to put on pods. I'm working on another sisal basket, hopefully with a lid... it is small... and I'm thinking of decorating the exterior with thread and/or paint. Mark is tilling Grandma's garden, today. I am happy to report the grapefruit peel oil and witch hazel combination seems to be working fine - I've used it three days in a row now. I still have to strain it, and hope I don't lose the oil. There were other things I could have done with my ambition today - but there wasn't as much of it as I had planned for. So I talked myself into playing with good smelling leaves.. which wasn't that hard to talk in to (as it was for cleaning or sewing today) as I had thought it would be. I put on my shoes, grabbed some scissors and went right out. There were two trays of mint leaves, and a few rose petals that had drooped on the roses in the vase above. The large leaves are apple mint, and the small ones are classic peppermint. I learned a while back to save the smallest bits of leaves and wrap them up in paper towel to dry. They are actually the most potent - and add a lot to the resulting dried mixture. I got quite a bit done yesterday - finished that basket, transplanted the peppers into larger pots, washed some things, organized our desk areas again... did a lot of laundry... Esme and I played checkers and we read a bit out of her Vision book (a new science book I ordered for her) before bed. Not such huge plans for today. I think I want to patch a few pairs of pants (my kickaround pair and one of Esme's) and make some button hang pockets for the headphones on my desk and my slippers at my bedside. I'm still thinking about the slippers one - but the headphones one seems like it will really work and be useful. The garden is looking nice and some things are continuing to come up - more beans, squash and cucumbers. The poppies have not bloomed again but Mark had brought one in that did before the rain - and it is happy in a vase downstairs. Daphne lost one of her nine puppies this morning - not sure why... sometimes it happens. Esme saw it before she went to school but I just lowered my voice and said sometimes it happens, and she took the cue to not be upset. I was impressed she took the same tone breaking it easy to Daddy - sad, 'low', but not overwrought. Our DeeDee Great Dane mix is feeling a bit low after all this rain, as well... she is coming on eight to ten years old, which is very old for them. She has a Parkinson's like shake to her sometimes, now - as does her sister Blaze. They were from the same litter but DeeDee has always seemed more robust than Blaze in that way.. and now she is getting it, too. I've really been enjoying trying new fibers and trying my hand at basketmaking, as well - for use around our house and for the experience of making them. Last week I picked up some sisal twine at the store - and with a medium large crochet hook and some downtime - I made this. Each side was made flat and then it was all sewn together with very strong cotton crochet thread - then the handles were crocheted on with the yellow cotton yarn. I have ideas for making another one with less sewing... but more shape to worry about as I go along... The material was very tough on my wrist initially.. but the results were worth it. And - it only took one 525 yard ball of twine, which cost about a dollar... which is kind of amazing. There was kale and 'spinach mustard' to be had in the garden today, as well as herbs. I combined them into this recipe. A small handful of young kale leaves, with as much stem as possible removed. a tiny bit of garlic powder at the end. I added this together in a medium saucepan with enough water to cover and simmered on medium with the lid on (steam holes open) for about a half hour - added some more water, simmered again until the kale and mustard did its classic look (see above) and the beans began to make some broth. Served with buttered toast. alterations that could be made: Could run it all through a food processor and make a creamy type soup. I've seen that in a lot of recipes. Or, my instincts at the point I puled it was that I could make a butter and flour rue and thicken it up a little and maybe add a bit more garlic powder to it after that. Instead I opted for the toast and a thin broth. It would be really nice with some cottage cheese on the side, too. Pretty good .. but I'd go much easier on the vinegar next time - I think I used a splash and a half when I needed only a splash. In the Garden: I put up the bean fence, weeded, planted a lot more things (I know... there is already so much there...but we are looking for useful jungle not grass jungle...)..
a cheap package of green arrow peas.. The sweet peas were blooming - Mark pointed them out to me yesterday. I did the math, it has been about 54 days since I planted them - which was March 18th.. although they seemed to take forever to come up. We have bits of okra, squash, cucumbers, sunflowers, green beans, radishes, mustard (for the chickens, mostly), kale, marigolds, corn and gourds coming up. There was a lone nasturtium.. I might need to buy another package of those. It was a sweet Mother's Day mostly - although I had to work in the morning until five pm.. Mark and Esme met me at work, which always makes me smile - and we bought a plant for Grandma (and one for our garden, too). Mark presented me with a new pancake turner and some cucumbers to make my cucumber salad with. We had bought some last week and they had gotten lost in the car from the grocery store .. the chickens enjoyed those. Then we went for ice cream sundaes and home to plant our plant and work in the garden a bit. Then it was time for our usual battle of the bedtime with Esme. She was particularily sad and upset because I had let her take a long time bathing and then hurried her to bed. She hates to be hurried.. but sometimes it has to happen in life. She got up early and mostly happy to have slept, and got off to the school bus. Her cough and Mark's have gotten a bit better - but it is going back and forth kind of. Mark told me a story about her yesterday. She came in with only one of her shoes - and said she couldn't find the other one. She had taken them off to play and then came back and there was only one. He told her to go look for it - and not to 'take shoes off to play' anymore without putting them up somewhere she can find them. She came back and said that Minerva had her shoe - she didn't have it, and then she turned around and she did have it and was chewing on it. I wonder if that was the end of the black shoes - as I saw her in the pink ones when they came to get me at work. I've set out to learn more about lemon balm and how to use it - it is so bushy! Going out to the garden to get a picture of the sweet pea - and plant a few extra seeds. Still planning where and how to put up some more bean fences. I was sorting my miscellaneous jar of grown beans (ones that came out of our garden at one time or another these past few years) and that was why Esme was in the bath for so long.. I was in the kitchen using the good light to sort one brown oval bean from another oval brown bean with stripes etc etc... silly I know - I do these things. I'm going to spread the love today - bringing a bag of the blue black shackamaxon beans to a friend at work. She had come into work and I had helped her with her PVC plan for bean fences, which was inch and a quarter pvc pipe, cut to 8 foot lengths, and the extra end pieces put on elbows with couplings between them. She pounds these upside-down U shapes into the ground and puts welded wire fence on them for the beans to grow up. I was thinking more traditional tipi styles...but not sure what to make it with yet. Her pirate map and a Spud dog. And since Esme was saying she was running out of playdresses and summer is on its way - I made this. The white paisley fabric is heavy denim, but there wasn't enough of it to do much else with... and the other fabrics were the last bits of scraps that made something that 'sort of' went together. The lining is a green 'hello my friends' fabric from a Japanese pack long ago, and the blue was from a friend years ago when I made matching dresses for Esme and her daughter. It is open in the back to halfway down with a button at the back neck. I hope it will fit for a while. The picture shows my messy studio space.. but that is part of the process lately. We had laid down an old piece of underlayment in the kitchen on the concrete floor to keep it warmer. I had seen some ideas for 'wood rugs' and wanted to add some life and color to the rug. Mark said go ahead - and some masking tape and craft paint later we get a little bit of 'different' that may not last forever but it is interesting while it does. Minion and her kitten are confused by it all...there was much shooing off of little feet and even a little bit of cover-up of tiny footprints that found their mark. I got a surprise this morning. The chickens were making some odder than usual noises that had been going on for a while - went to the garden and saw this blooming. It is a perennial Icelandic poppy from the clearance rack last year - and it is really making its showing, now! In other news: Esme and I have been having quite the discussion about her responsibilities - which are not much, but to her, they are. 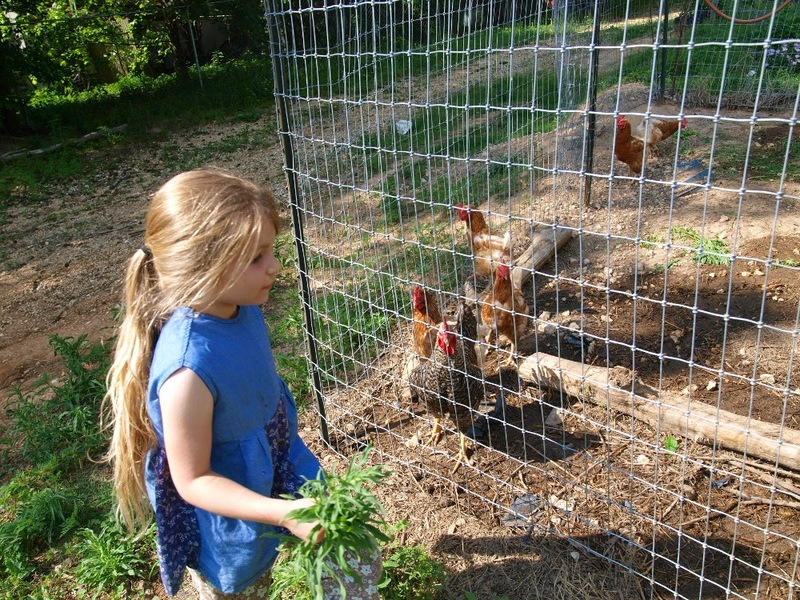 Besides doing her homework, washing her hair every night and packing her lunch we also ask her to take a scoop of food out to the chickens, collect eggs, wash them and put them in the refrigerator. She also gets ten cents an egg, accumulated at the end of the week - for the ones she actually collects. Three times this week she made Daddy do it for some reason or other... and we had two talks about it, including the losing of privileges that might occur on Mom's days off - like going to the park or a playplace.. which can't be rewarded if she hasn't done her work for the week. Quite a lot of tears, lots of needing explanation, arguiging, asking questions like 'how will I learn to put happy or sad faces on the calendar if I'm not allowed to put happy or sad faces on the calendar as a kid?' **Facepalm** Anyway... we may be on track to go out tomorrow, maybe not.. we'll see..
She told me she needed more play shirts - she couldn't find any. Daddy found one for her right there in her drawer. I do need to go through and look... haven't sewn in a while. Crocheted a basket out of jute rope the past few days and it looks pretty good -- will maybe get a picture of it tomorrow. We have a bean fence to get up, chicken coop to clean, and maybe some seedlings to get out if it doesn't want to rain too hard.. The garden is coming along - a cucumber and a summer squash are sprouting, as well as the cowpeas, corn, sunflowers, marigolds, zinnias, radishes, morning glories and kale...hoping the next few days bring more cucumbers and squash. I want them to try to get as early of a start as they can in this late Spring to get ahead of the bugs I know will be coming June and July. Our pepper is alive, and all but two of the tomatoes. There are more of both of those inside that can be planted outside perhaps tomorrow. The sweet peas are climbing the fence and my climbing black Shackamaxon beans seem to be coming well. The perennial, herbs and greens part of the garden. Some things are coming up well... I was happy to see our Icelandic poppies coming back, gladiolus, hosta (not here, but across the garden) and the lemon balm, oregano and mints coming back. Some Cosmos might have reseeded, but I planted more, too. The real surprise was a row of carrots from last year that had tucked itself in by the gladiolus and is coming back in full strength! Carrots are biennials - so I might get to see some flowers and seeds if I leave them there. I planted this year's carrots by the peas... we'll see how that goes. Sweet peas climbing the bean fence. Esme is doing a bit better with her allergies/cold that was developing this week. She ran happily up the road for her school bus (with us close behind) this morning. The chickens are doing well, also. I really need a day off, which is Friday, although it will likely be spent cleaning their coop, cleaning the house and possibly planting more. We know me.. I will probably plant something - I have a list ;) That list includes putting up another bean fence between the tomatoes and the corn, to put more pole beans on. Esme and I walked down to the lake this morning about seven, and picked wild flowers. We then brought them back and we both took turns drawing what we had found, and making a book. Now she is eating grilled cheese and watching a cartoon. I'm going to try to go through my seeds and see what else we can plant in the garden that is getting to the end of its viability. I bought an evening primrose to plant, as well - and of course, Esme is going to try her best to wear me out with all sorts of games she has planned. Mark says we need to till another garden, and clean out the chicken coop. // I gave Esme her illustrated encyclopedia set today, with her other science and reading books. We had bought it a few years ago at a library sale, a full set with four color lithograph illustrations. I had hoped she would take care of it, tried to interest her in it a few times, but she has been on a library kick playing 'librarian' the past few days. // It's kind of a big day for geek parents... I've ordered her a few books of a science series and am hoping she will like those and build her collection. She took a book on light and color to her bed last night and was looking at the pictures (it was a bit above her head).. but she showed me the telescope picture in the morning and put the book back nicely. Esme took the chicken death as well as can be expected. She has had some trouble at school, trying to sort that out - kids teasing her but she isn't/wasn't precise about exactly which things happened and which didn't, or didn't happen recently, at the very least. I take it as a learning experience all around, like the jacket incident earlier in the year. Her TCAP Tennessee state testing is this week, so I wish it hadn't come up during this - but it was affecting her and Mark saw it, too... hopefully it is handled well, now. We'll see. I'm back on a bit of a reading kick - science, math etc... different things bouncing in my head. I haven't sewn much lately, though... and my knitting project has been on the table untouched for a day and a half... so much to do, and work is such a big block of it doesn't always leave much time for much else. Trying to get to Sunday, next day off... Symmetry magazine came in the mail, and was reading that - it goes in well with some of the chirality/symmetry chemical molecule, particle physics and abstract algebra topics that have piqued my interest the past few days.. not that I get anywhere on purpose studying these - but things come in my brain here and there, and I go to look them up, and they send me in another direction, and then more 'clicks'... I like that process, at the very least. And I know why when I was reading about coordination compounds the words 'well, what is phenol oxalate, then?' came up in my 'brain queue' later - it is glowsticks :) ha. I guess I have to keep that undercurrent brain process busy with something when it isn't engaged with plumbing repair parts. --I got a hug from an elderly customer yesterday (I've helped him for five years or so now, and it was a side hug because he was so relieved) when I asked him to bring me the 'entire' stem for their shower instead of just a small piece - the piece was intriguing, I _wanted_ to know what it came from, but there just wasn't enough of it. to know for certain. I knew I had never seen it before on an item I had sold - but it looked close to several things I had not had hands on before that I found in parts diagrams. I explained exactly what I needed to know- he brought it back and from several hallmarks combined I positively identified it, called the company and got them to send him a new one under warranty which will arrive in three days. That is what that brain process is usually involved in, finding, researching, storing and retrieving part information.